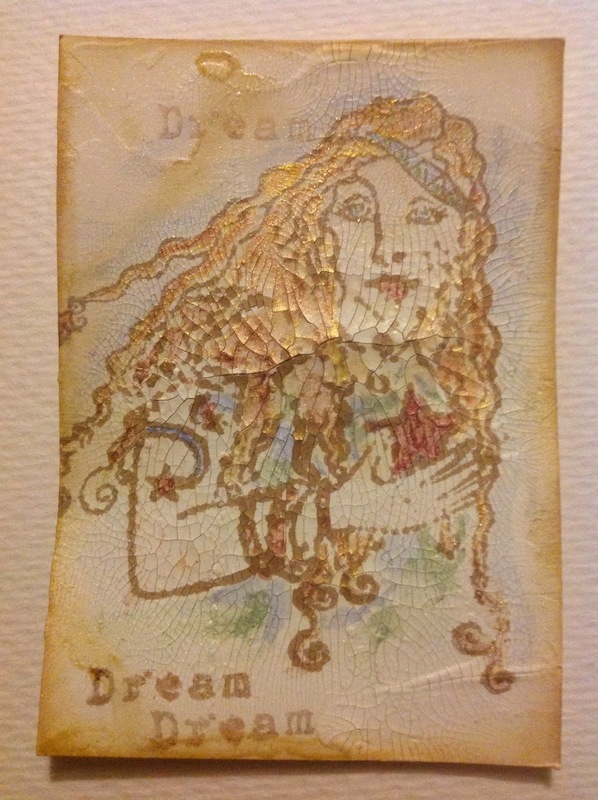 While trying to get some "real" work done I spread a layer of crackle paste on an ATC, so I could take a last minute try at a thought that came by while I got acquainted with the current Paperartsy Challenge (Grunge Paste). Hmm, didn't check the time limit on the challenge, it has closed a couple of hours ago, but happy crafting anyway! Inspired by a video where stamping is done on surface dry grungepaste to give a relief feel to the surface, I have already tried to stamp on surface dry crackle paste (this is Finnabair) only to find that it did NOT work ( no image, just a squish). This time I let the paste dry completely, and wanting a rugged look I stamped straight onto the surface with this celestial image that came in a grab bag I won from Rubberdance. I stamped with Versafine Vintage Sepia, and somehow the ink bled around in the middle of the image where the paste might have still been a bit moist (even though Versafine isn't water soluble)... or perhaps it was the crevises of the crackle paste that effected the ink. I coloured the image with mica watercolours, and since my eyelids are dropping, I believe she is telling me to take the dog out for a last pee and go to bed!